The Venerable Ephraim of Perekop was born on September 20, 1412 in the city of Kashin. In Holy Baptism he was named Eustathius. His parents, Stephen and Anna, lived not far from the Kashin women’s monastery named in honor of the Dormition of the Most Holy Theotokos. After three years in the monastery, Eustathius, through a miraculous revelation, transferred to the monastery of Saint Sava of Vishersk (Oct. 1). It was there in 1437 that he accepted tonsure with the name Ephraim. While in the monastery, Saint Ephraim received a revelation from the Lord, commanding him to withdraw to a desolate place. Having received the blessing of Saint Sava, in 1450 he went to Lake Ilmen, at the mouth of the River Verenda, and on the banks of the River Cherna he built a cell. After a certain while the Elder Thomas and two monks came to Saint Ephraim, and they settled not far from his cell. From that time, other hermits also began to gather at the new monastery. 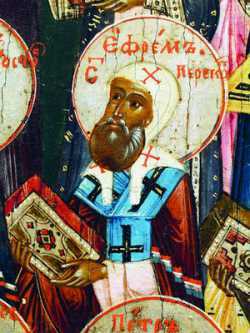 At their request Saint Ephraim was ordained a priest at Novgorod by Saint Euthymius (Mar. 11). Returning from Novgorod, Saint Ephraim built a church in honor of the Theophany of the Lord on an island, at the mouth of the River Verenda. To secure a ready supply of water for the monastery, the monk dug a canal to Lake Ilmen, from which the monastery received its name “Perekop” (from “perekopat” meaning “to dig through”). Later on, Saint Ephraim built a stone church named for Saint Nicholas the Wonderworker. Unable to find sufficient skilled builders, he sent several monks to Great Prince Basil with a request for sending stone-workers. The construction of the temple was completed in 1466. Saint Ephraim reposed on September 26, 1492 and was buried at the Church of Saint Nicholas. In 1509, because of frequent floodings that threatened the monastery with ruin, it was transferred to another location at the shore of Lake Ilmen. Saint Ephraim appeared to the abbot Romanus and pointed to the site of Klinkovo for relocating the monastery. Over the saint’s tomb a chapel was built, since all the monastery churches were in ruins. On May 16, 1545 the relics of Saint Ephraim were transferred to the site of the new monastery. 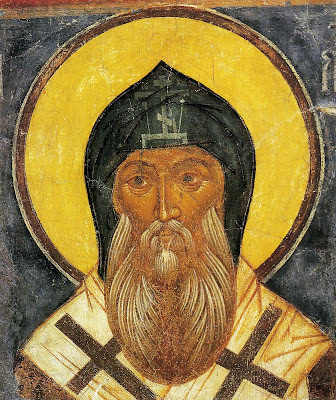 On this day there is an annual celebration of Saint Ephraim of Perekop at the monastery, confirmed after the glorification of the holy ascetic at the Synod of 1549. The Translation of the Relics of Saint Ephraim of Perekop is celebrated May 16.